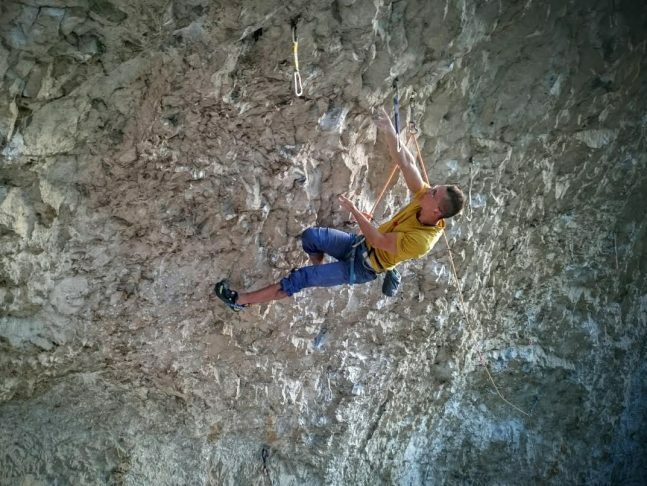 Just a couple of days after succeeding in Sanjski par extension (9a) and Talk is cheap (8c) both on the same day, young and strong World Cup competitor Jakub Konečny from Czech Republic redpointed as well Martin Krpan (9a), the hardest route in the right part of Mišja peč. More about the route and its name you can find out here. To finish the day in a proper style, he crushed as well super bouldery Ninja želva (8c), the extension of Tortuga (7b). In the big cave of Osp, Italian Matteo Menardi managed a second ascent of Revolucija (8c+) after the big stalactite (where you used to have a no hand rest) fell down from the top of this 25 meters long roof. After the break it was only climbed by Domen Škofic already back in 2012 and until now remained unrepeated. It is a crazy route characterised with a hard and nice boulder by the third draw, followed by really pumpy and tricky roof climbing to »the new redpoint crux« with feet first where the big stalactite used to be. Amazing route and a great ascent! In the same cave, Ajda Lovše clipped the chains of her second 8a, the first part of Active discharge. Another pearl you don’t want to miss! On the Italian side of the border, above Trieste in the climbing area named Baratro, Luca Bacer climbed L’impero dei sensi (8b+). Wish you all great climbing in Istria!